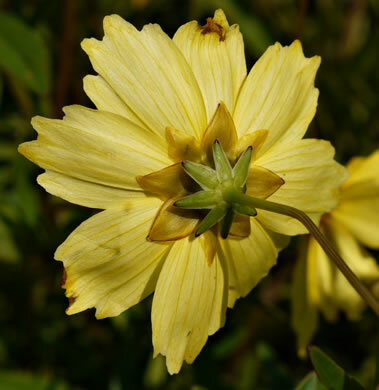 Your search found 54 image(s) of involucral bracts of DYCs with ray and disc flowers. 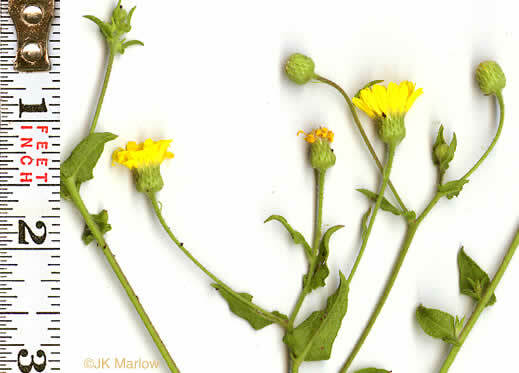 Phyllaries 13 or 21, light green (tips sometimes black), 5-8mm, glabrous, per Flora of North America. 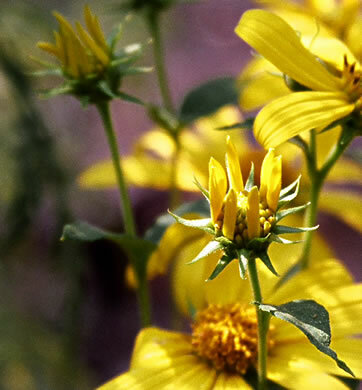 Involucral bracts purple-tipped, 0.2" [5mm] long, per Wildflowers of Tennessee, the Ohio Valley, and the Southern Appalachians. 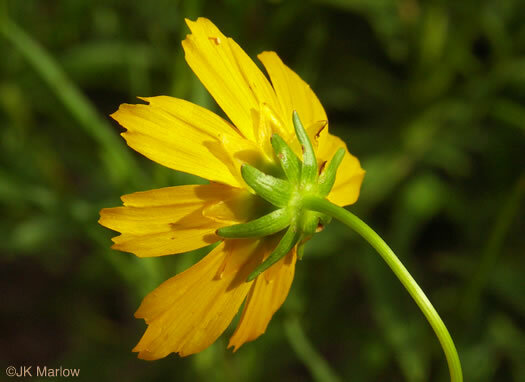 Involucres cylindric to turbinate, 4-6mm long, per Vascular Flora of the Carolinas. 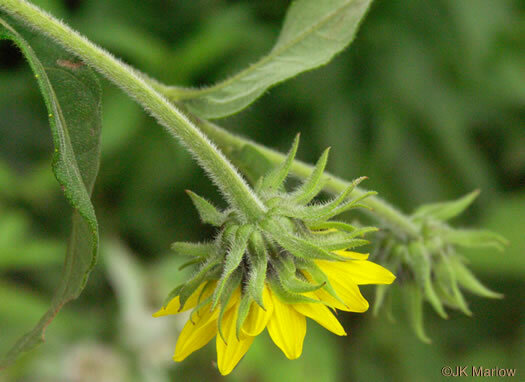 Bracts stipitate-glandular (as are the peduncles), appressed, per Vascular Flora of the Carolinas. 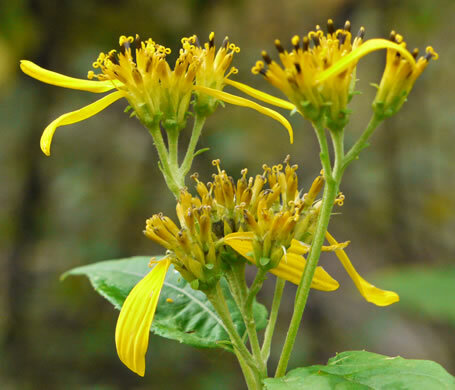 Involucres hemispheric; bracts linear, appressed, stipitate-glandular, per Vascular Flora of the Carolinas. 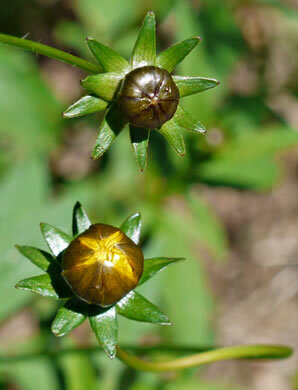 Involucral bracts ovate to elliptic, obtuse to acutish, per Vascular Flora of the Carolinas. 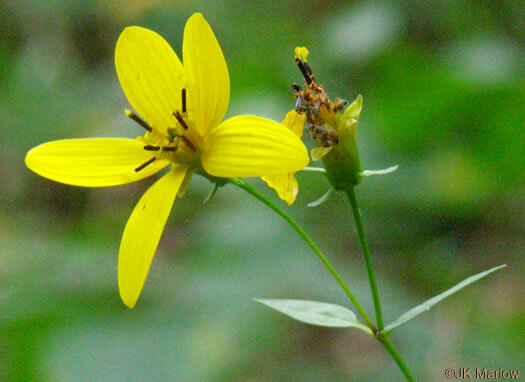 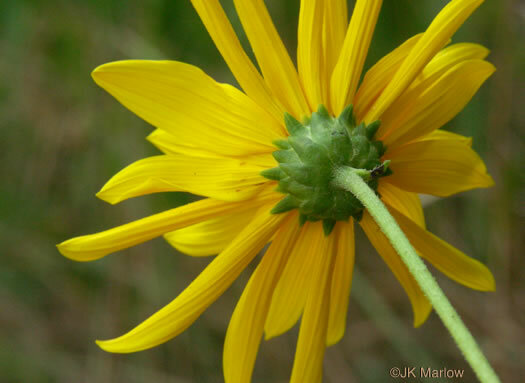 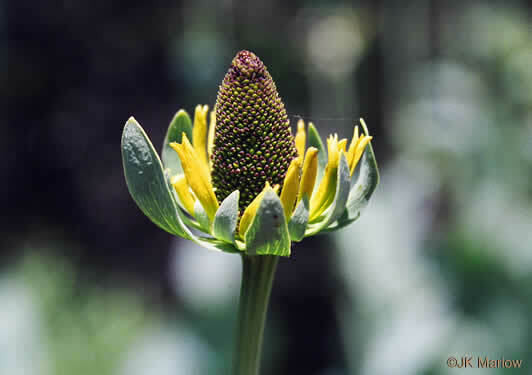 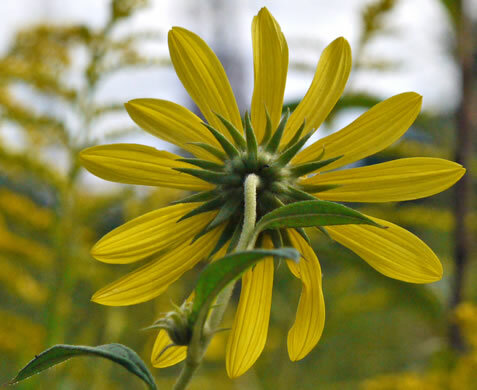 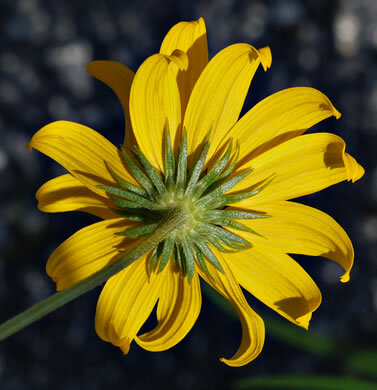 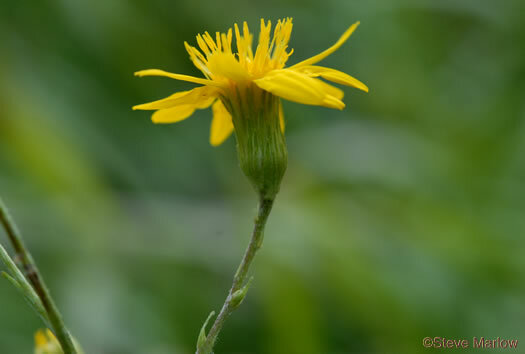 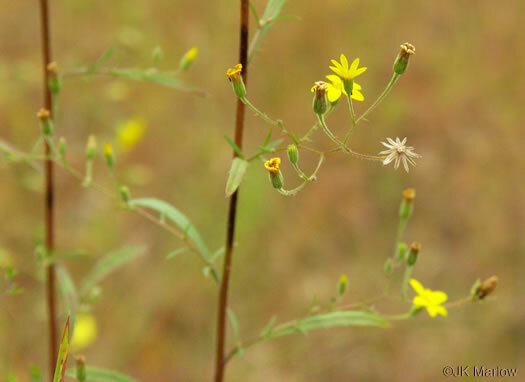 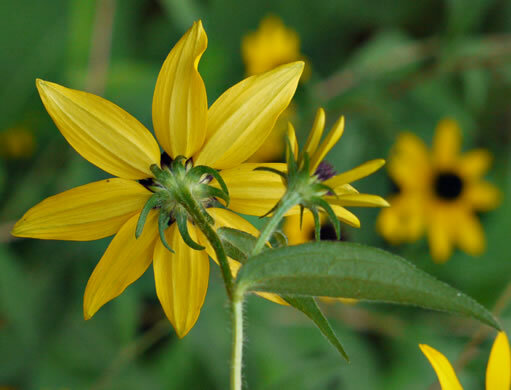 Involucral bracts of the genus Silphium are wide and usually squarrose, per Vascular Flora of the Carolinas. 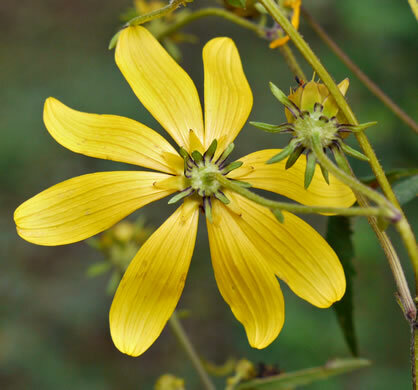 Bracts wide, usually squarrose, acute or obtuse, glabrous, ciliate or erose, per Vascular Flora of the Carolinas. 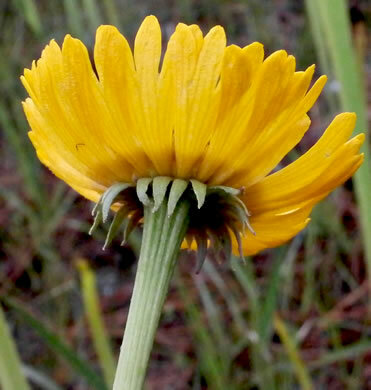 Rows of large recurved bracts beneath the disc form a cup-like shape, per All About South Carolina Wildflowers. 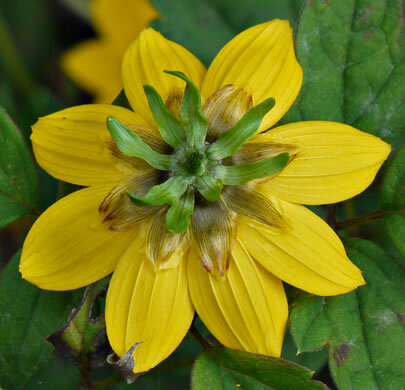 Bracts oblong, glabrous, cartilaginous w foliaceous, often spreading, apices, per Vascular Flora of the Carolinas. 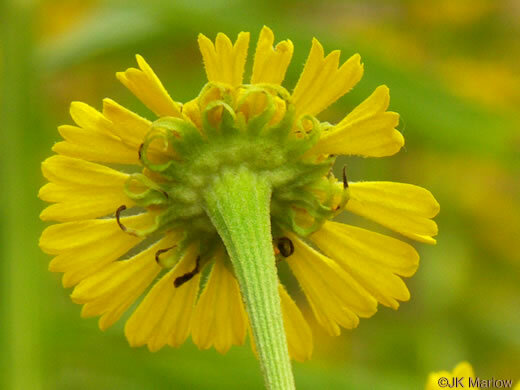 Involucral bracts lanceolate to oblanceolate, essentially glabrous, acute, per Vascular Flora of the Carolinas. 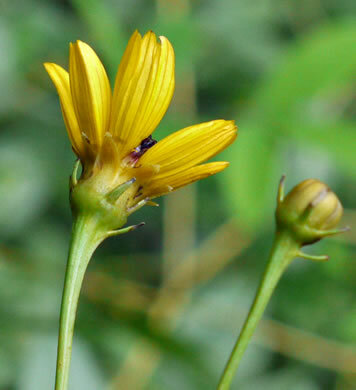 Phyllaries to 2cm, per Flora of North America. 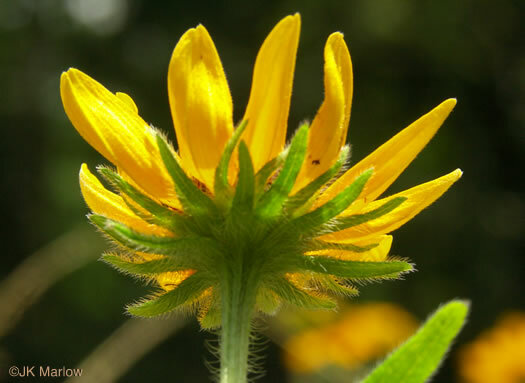 Involucral bracts linear, 5-12mm long, spreading to reflexed, per Vascular Flora of the Carolinas. 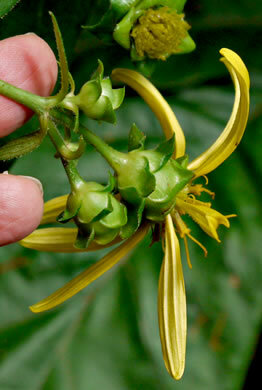 Involucral bracts linear to lanceolate, acute, spreading pubescent, per Vascular Flora of the Carolinas. 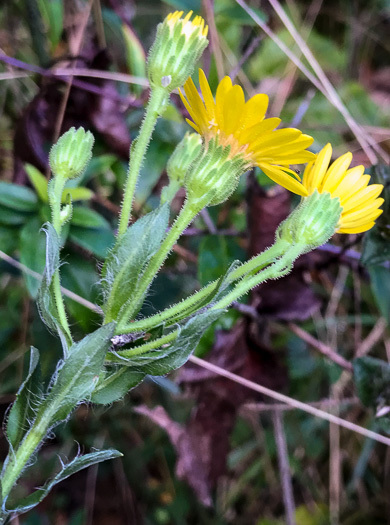 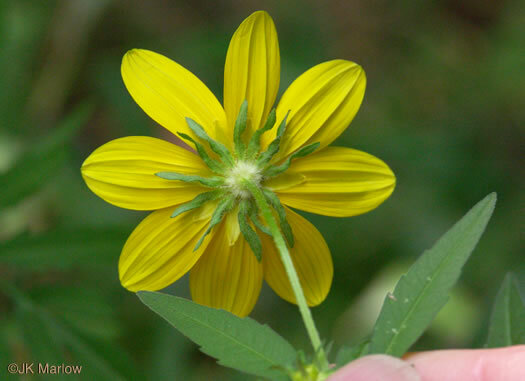 Disc 4-8cm at maturity, per Wildflowers of the Eastern United States. 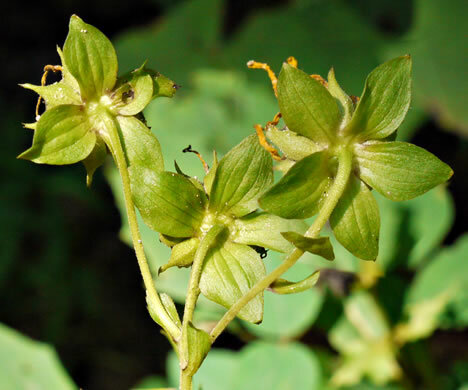 Involucral bracts are in several series, per Vascular Flora of the Carolinas. 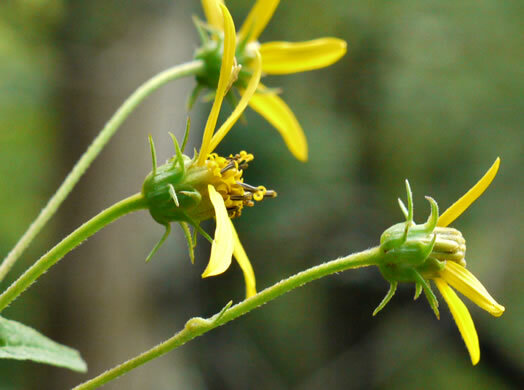 Involucral bracts in several series, lanceolate to linear, acuminate, per Vascular Flora of the Carolinas. 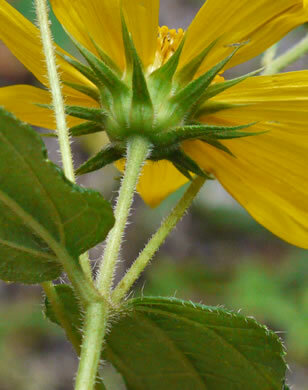 Involucral bracts lanceolate, acuminate, the tips often reflexed, per Vascular Flora of the Carolinas. 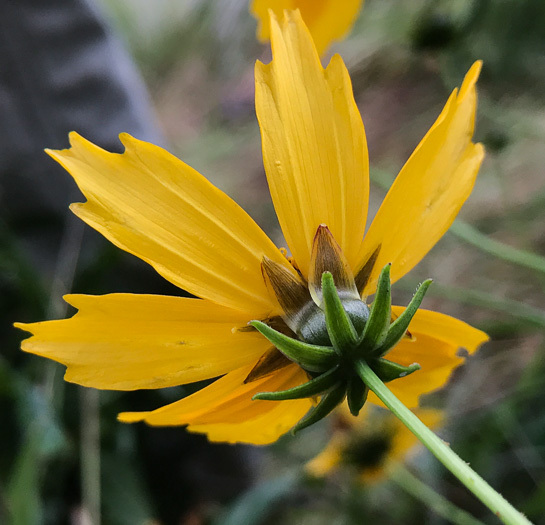 Involucral bracts lanceolate, hairy along margins, often w reflexed tips, per Wildflowers of Tennessee, the Ohio Valley, and the Southern Appalachians. 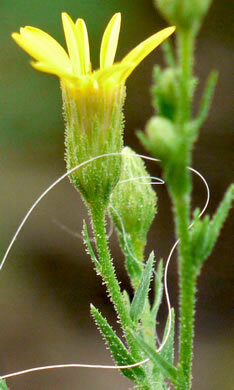 Stem hirsute. 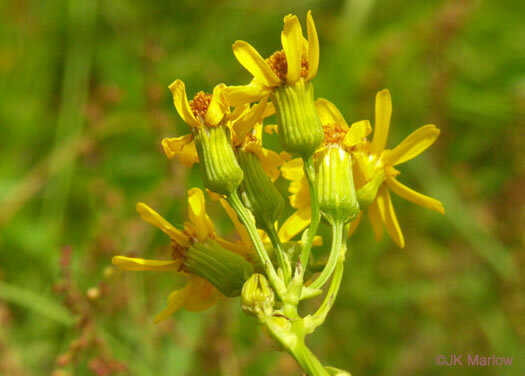 Phyllaries lanceolate, usually loose, spreading, not reflexed, per Flora of North America. 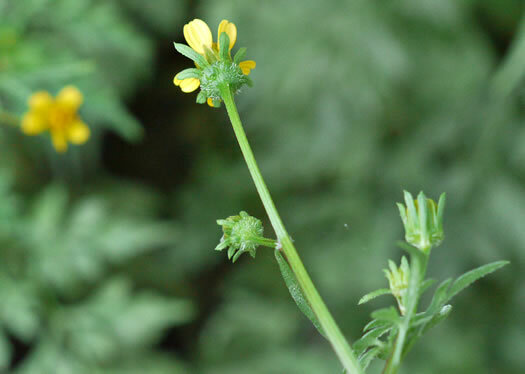 Longer phyllaries usually exceeding disk by half their length+, apex acuminate, per Weakley's Flora. 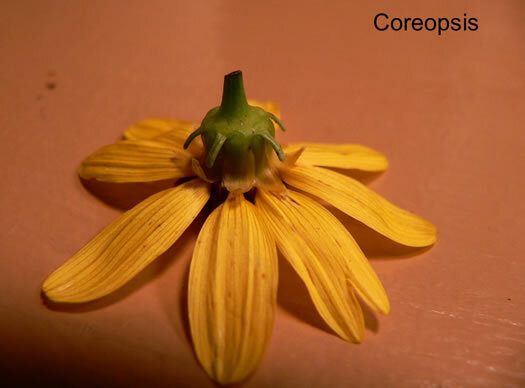 Involucres 0.7-1cm long, bracts lanceolate, usually spreading apically, per Vascular Flora of the Carolinas. 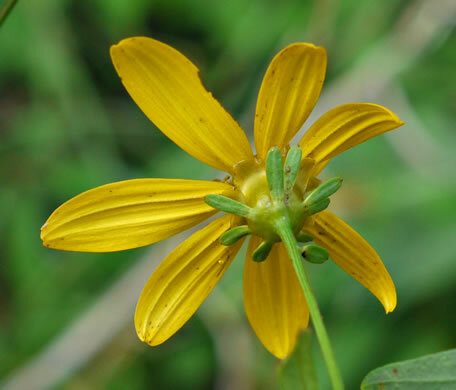 Involucres 3-5cm broad; bracts lanceolate, acuminate, spreading, per Vascular Flora of the Carolinas. 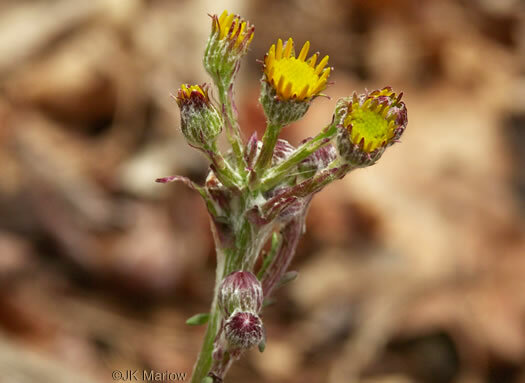 Phyllaries not conspicuously graduated & imbricate, usually loose or spreading, per Weakley's Flora. 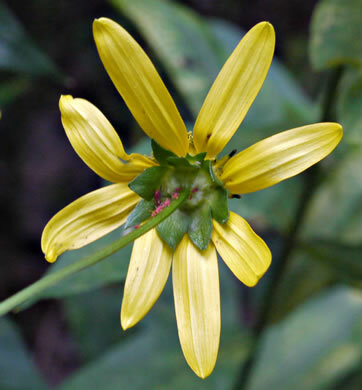 Involucral body 2-10cm+ broad; bracts ovate abruptly long-acuminate, spreading, per Vascular Flora of the Carolinas. 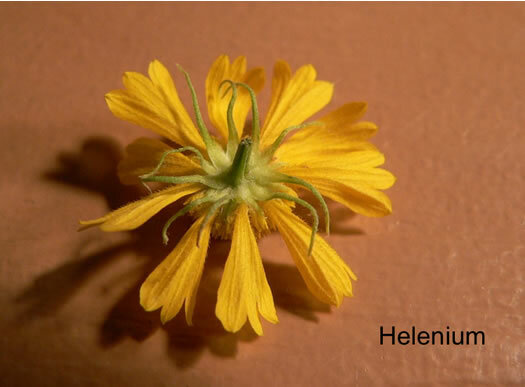 Phyllaries in 1(-2) series, ~ spreading to reflexed, per Flora of North America. 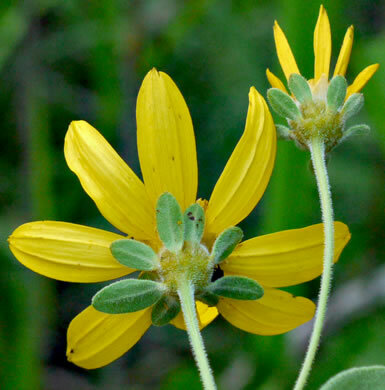 Phyllaries in 2 series, more or less erect, per Flora of North America. 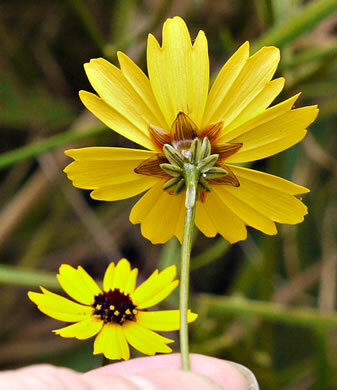 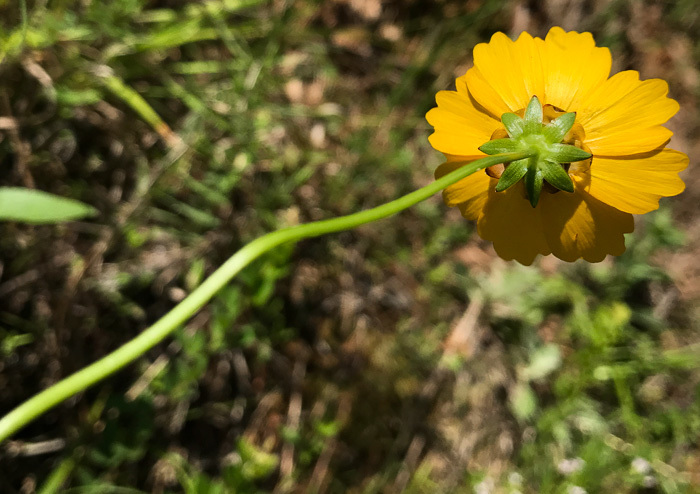 Coreopsis has 2 distinct series of involucral bracts - outer narrower & green, per Vascular Flora of the Carolinas. 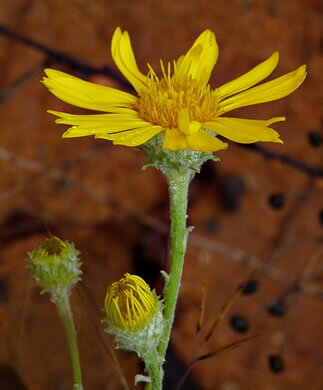 Outer phyllaries lanceolate, 0.4-0.8X as long as the inner phyllaries, per Weakley's Flora. 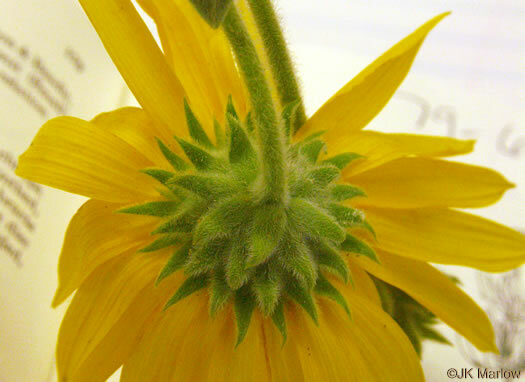 Outer involucral bracts green, lanceolate; inner elliptic to lanceolate, per Vascular Flora of the Carolinas. 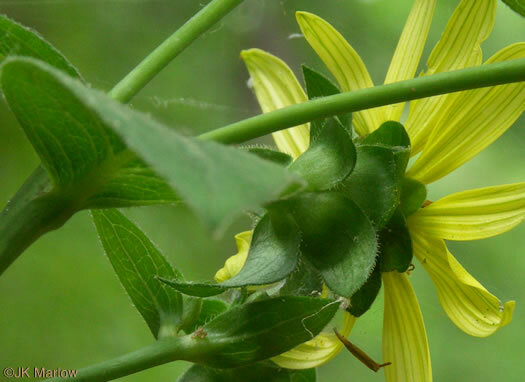 Outer involucral bracts green, lanceolate; inner eliptic to lanceolate, per Vascular Flora of the Carolinas. 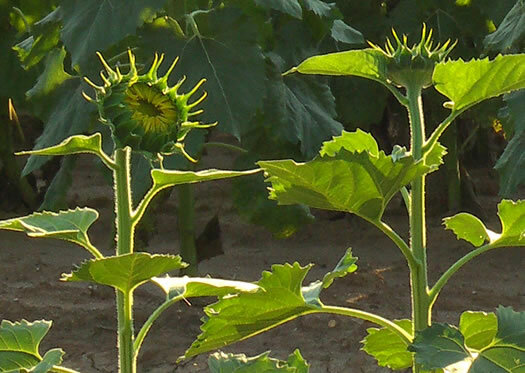 Here the outer phyllaries are spreading, the inner just beginning to open. 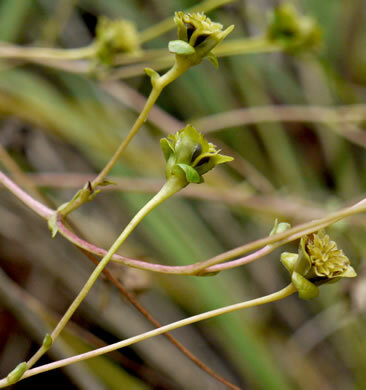 Calyculi [outer involucral bracts] of lanceolate to lance-linear bractlets, per Flora of North America. 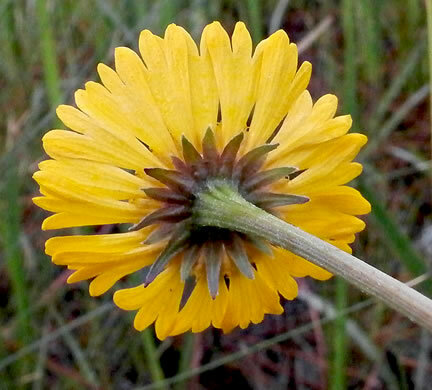 Outer bracts lanceolate, 6-10 mm long; inner lanceolate to elliptic, 7-13mm, per Vascular Flora of the Carolinas. 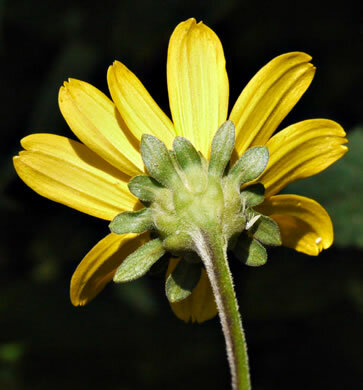 Outer involucral bracts oblong or oblanceolate, 2-10mm; inner lanceolate 5-8mm, per Vascular Flora of the Carolinas. 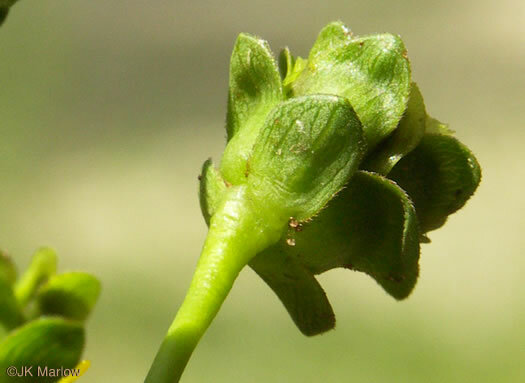 Outer involucral bracts linear, 4-6mm long: inner lanceolate, 7-8mm long, per Vascular Flora of the Carolinas. 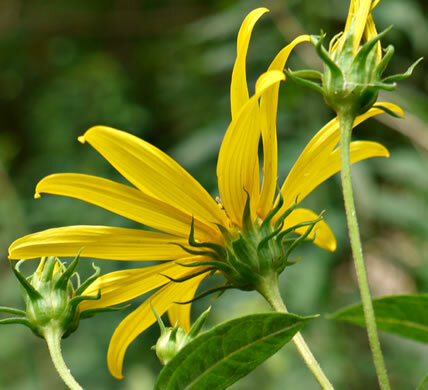 Outer involucral bracts leafy, typically surpassing the disk, per Wildflowers of Tennessee, the Ohio Valley, and the Southern Appalachians. 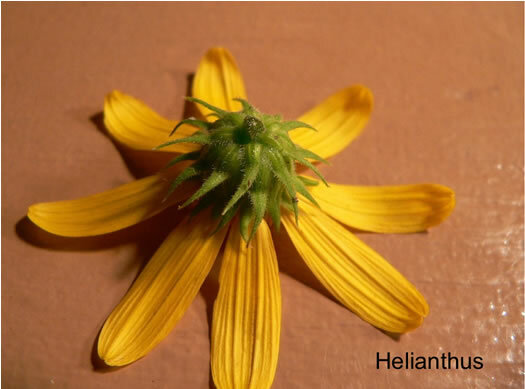 Outer involucral bracts shorter than the inner, fewer than B. polylepis, per Wildflowers of Tennessee. 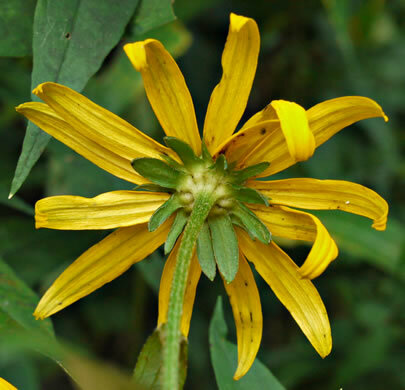 Outer involucral bracts curled and twisted, and longer than inner bracts, per Wildflowers of Tennessee, the Ohio Valley, and the Southern Appalachians. 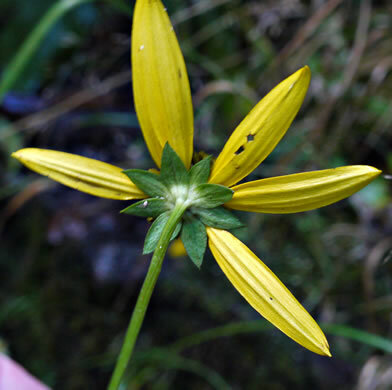 Outer bracts green, 2-7mm long, very narrow; inner 4-8mm long, per Vascular Flora of the Carolinas. 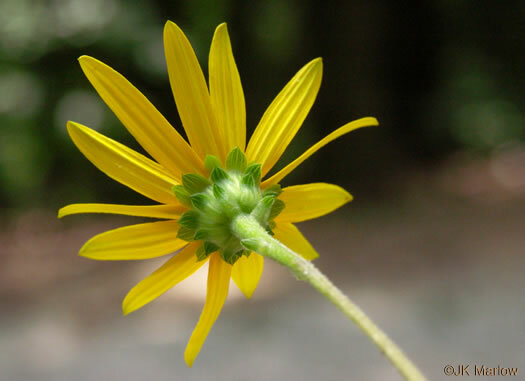 Involucre of one series of linear bracts, 5-10mm long, per Vascular Flora of the Carolinas. 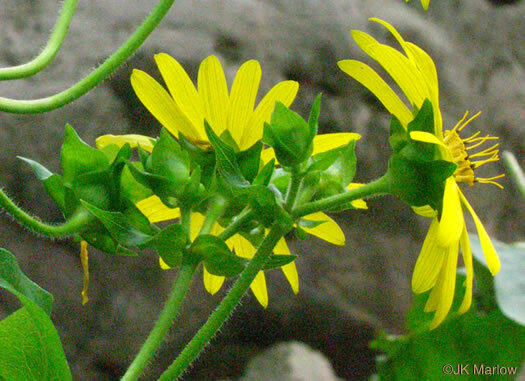 Peduncles usually glabrous, sometimes sparsely hairy; cypselae glabrous, per Flora of North America. 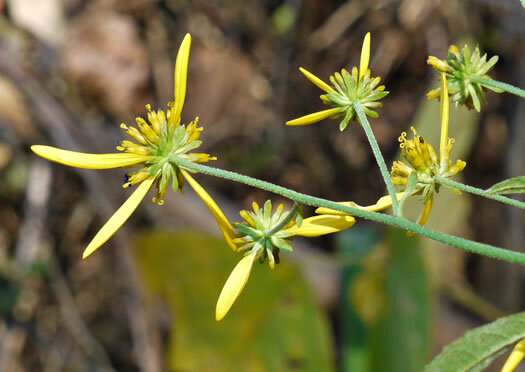 Involucre of one series of linear bracts, per Vascular Flora of the Carolinas.